Fuel cell science is undergoing significant development, thanks, in part, to a spectacular evolution of the electrocatalysis concepts, and both new theoretical and experimental methods. 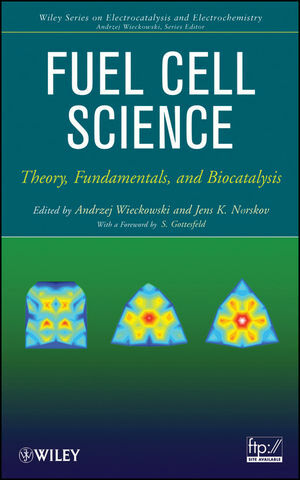 Responding to the need for a definitive guide to the field, Fuel Cell Science provides an up-to-date, comprehensive compendium of both theoretical and experimental aspects of the field. A wide spectrum of theoretical and computational methods, with?the aim of?developing?new fuel cell catalysis concepts and improving existing designs to increase their performance.? Written for electrochemists and electrochemistry graduate students, electrocatalysis researchers, surface and physical chemists, chemical engineers, automotive engineers, and fuel cell and energy-related researchers, this modern compendium can help today's best minds meet the challenges in fuel science technology. Andrzej Wieckowski is Professor of Chemistry at the University of Illinois at Urbana-Champaign. Professor Wieckowski pioneered the development of the method now known as Electrochemical NMR (EC-NMR) that combines metal/surface NMR and electrochemistry for studies of interfaces. Jens K. Nørskov is Professor of Chemical Engineering and Photon Science, Stanford University, and Director of the Center for Interface Science and Catalysis at the SLAC National Accelerator Laboratory. His research interests include the theoretical description of surfaces, catalysis, electrochemistry, materials, nanostructures, and biomolecules. Preface to the Wiley Series on Electrocatalysis and Electrochemistry. 1. Hydrogen Reactions on Nanostructured Surfaces (Holger Wolfschmidt, Odysseas Paschos, and Ulrich Stimming). 2. Comparison of Electrocatalysis and Bioelectrocatalysis of Hydrogen and Oxygen Redox Reactions (Marc T. M. Koper and Hendrik A. Heering). 3. Design of Palladium-Based Alloy Electrocatalysts for Hydrogen Oxidation Reaction in Fuel Cells (Sung Jong Yoo and Yung-Eun Sung). 4. Mechanism of an Enhanced Oxygen Reduction Reaction at Platinum-Based Electrocatalysts: Identification and Quantification of Oxygen Species Adsorbed on Electrodes by X-Ray Photoelectron Spectroscopy (Mitsuru Wakisaka, Hiroyuki Uchida, and Masahiro Watanabe). 5. Biocathodes for Dioxygen Reduction in Biofuel Cells (Renata Bilewicz and Marcin Opallo). 6. Platinum Monolayer Electrocatalysts: Improving Structure and Activity (Kotaro Sasaki, Miomir B. Vukmirovic, Jia X. Wang, and Radoslav R. Adzic). 7. The Importance of Enzymes: Benchmarks for Electrocatalysts (Fraser A. Armstrong). 8. Approach to Microbial Fuel Cells and Their Applications (Juan Pablo Busalmen, Abraham Esteve-Nuñez, and Juan Miguel Feliu). 9. Half-Cell Investigations of Cathode Catalysts for PEM Fuel Cells: From Model Systems to High-Surface-Area Catalysts (Matthias Arenz and Nenad M. Markovic). 10. Nanoscale Phenomena in Catalyst Layers for PEM Fuel Cells: From Fundamental Physics to Benign Design (Karen Chan, Ata Roudgar, Liya Wang, and Michael Eikerling). 11. Fuel Cells with Neat Proton-Conducting Salt Electrolytes (Dominic Gervasio). 12. Vibrational Spectroscopy for the Characterization of PEM Fuel Cell Membrane Materials (Carol Korzeniewski). 13. Ab Initio Electrochemical Properties of Electrode Surfaces (Ismaila Dabo, Yanli Li, Nic_ephore Bonnet, and Nicola Marzari). 14. Electronic Structure and Reactivity of Transition Metal Complexes (Heather J. Kulik and Nicola Marzari). 15. Quantitative Description of Electron Transfer Reactions (Patrick H.-L. Sit, Agostino Migliore, Michael L. Klein, and Nicola Marzari). 16. Understanding Electrocatalysts for Low-Temperature Fuel Cells (Peter Ferrin, Manos Mavrikakis, Jan Rossmeisl, and Jens K. Nørskov). 17. Operando XAS Techniques: Past, Present, and Future (Christina Roth and David E. Ramaker). 18. Operando X-Ray Absorption Spectroscopy of Polymer Electrolyte Fuel Cells (Eugene S. Smotkin and Carlo U. Segre). 19. New Concepts in the Chemistry and Engineering of Low-Temperature Fuel Cells (Fikile R. Brushett, Paul. J. A Kenis, and Andrzej Wieckowski).